Less than two years after the launch of the current generation, we are getting ready to see a new version, which will bring a significantly improved styling, as well as some nice mechanical upgrades. We are talking about the new 2020 Toyota Camry TRD, which will come directly from the company’s performance division. The famous sedan is well-known for its amazing quality, but the company wants to add an extra dose of excitement, which would boost its sales, considering that crossovers are taking over the market. For this occasion, we will see a fine portion of changes, starting from a new chassis setup, suspension, and similar mechanical upgrades. The new models will also come with a lot of aesthetical updates, which will clearly point on its performance characteristics. Unfortunately, things will remain the same under the hood. The 2020 Camry TRD is about to come with the same V6 engine. The Avalon TRD is coming as well. 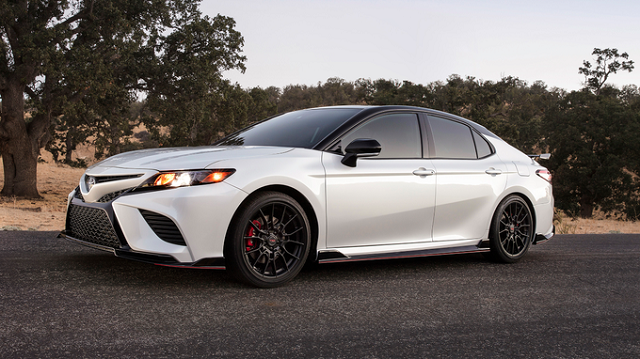 When it comes to the base 2020 Toyota Camry TRD specs, the new model won’t go far away from the standard version. Still, there is a fine portion of upgrades to come and the first thing that comes to mind is chassis. We are about to see chassis reinforcements and new suspension setup. Some of the notable updates are stiffer coil springs and sway bars. Also, count on new TRD shock absorbers. All these mechanical upgrades will provide better handling and overall driving characteristics. Also, keep in mind that the new version will feature lower ground clearance, which in practice means lower center of gravity, which further means better cornering, acceleration, and braking. Speaking of branking, count on new front rotors and rear dual calipers, with more inches in diameter, compared to standard models. Mechanical upgrades are always great, but aesthetics are the thing that attracts most buyers. Therefore, Toyota put a lot of effort into this aspect as well. At this point, we know that this will be a quite serious upgrade, which won’t include just cosmetical changes new grille, bigger wheels or fancy exhaust pipes. We are about to see a completely new body kit, which won’t just include new bumpers and spoiler, but massive side skirts, front splitter, and rear diffuser as well. All this will provide not just visual improvements of the sedan but also help in getting better aerodynamics and overall performances. The result should be slightly quicker acceleration, but also better fuel economy, due to less wind resistance. Some car enthusiasts will probably be disappointed to hear that the 2020 Toyota Camry TRD will come with the same V6 engine under the hood. We will see a familiar 3.5-liter engine that already powers standard models and delivers 301 horsepower. Still, keep in mind that the standard model is already pretty quick. It needs around six seconds to get to 60 mpg. As we already mentioned, the new model will feature better aerodynamics. So, it should be faster for a couple of tenths of a second, despite the same engine power. Same goes to the fuel economy. It will be slightly better compared to the current 22 mpg in the city and 32 mpg on the highway. 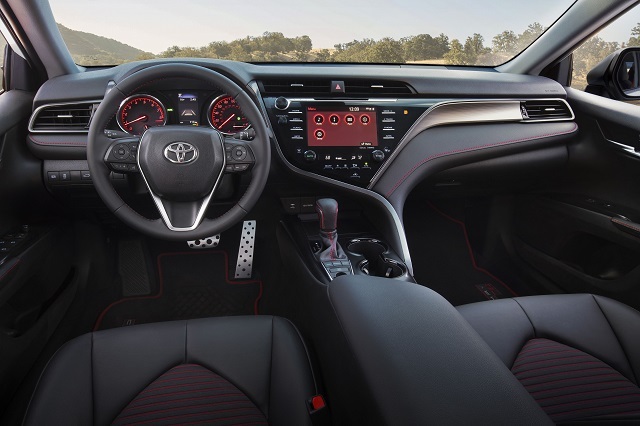 The 2020 Camry TRD interior will also come with a couple of upgrades. The overall cabin layout will remain the same but a couple of changes are expected as well. The first thing that comes to mind is “TRD” stitching on seats. However, we also count on a lot of red inside the cabin, in terms of ambient lighting, instrument cluster, touchscreen, etc. 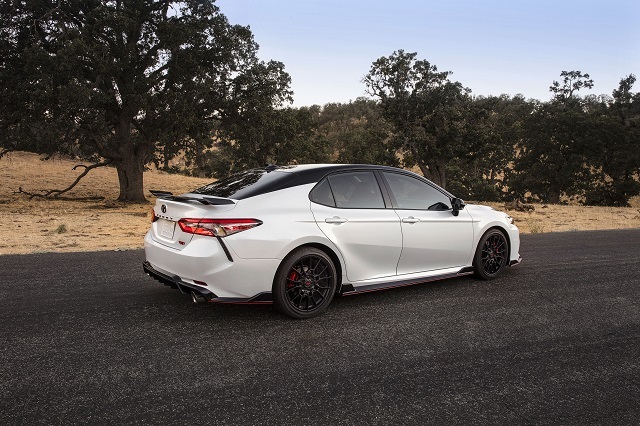 Other than that, the 2020 Toyota Camry TRD should remain largely the same, count on the same hi-quality cabin that comes with great materials, lots of styles and amazing comfort. Still, the list of standard equipment will be slightly different and could include some exclusive things. It is still hard to predict which ones, but a couple of tech upgrades and more convenience features seem likely. According to the latest reports, 2020 Toyota Camry TRD release date will be scheduled for the next fall. The 2020 Toyota Camry TRD price should go around 40,000 dollars.